Thriller author J. H. Bográn is in the hot seat today. He’s here to tell us a little bit about himself and his writing, in particular, his new novel Firefall. J. H. Bográn, born and raised in Honduras, is the son of a journalist. He ironically prefers to write fiction rather than fact. José’s genre of choice is thrillers, but he likes to throw in a twist of romance into the mix. His works include novels and short stories in both English and Spanish. He’s a member of the Short Fiction Writers Guild and the International Thriller Writers where he also serves as the Thriller Roundtable Coordinator and contributor editor their official e-zine The Big Thrill. Welcome, Jose. Please tell us about your current release. 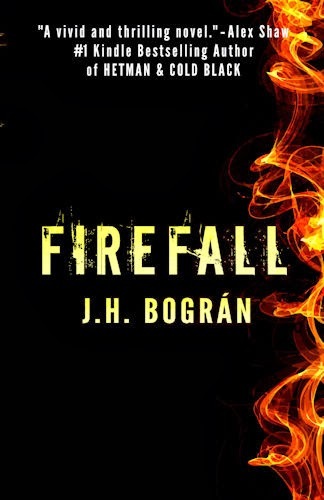 Firefall is the story of a wounded flawed hero coming to a new job in order to rebuild his life. Except, his first assignment lands him strapped to a chair and in the hands of a former KGB agent who likes to torture his victims with fire before killing them. I took the opportunity to showcase some exotic locations as half the events of the books happen in the Central American country where I grew up. The official release date of the book was September 15, 2015 which coincided with the 192th celebration of independence in Honduras. Neat, huh? By that time, I had my main character almost developed in my mind, he was to be a globe-trotting investigator, and the email sparked the idea of him going after a missing person—the victim of the fraud who had been naïve enough to meet the “bank staff” with deadly consequences. Eventually, the idea grew and morphed, and the bad guys became a ring of car thieves instead of internet con artists. Of the initial seed, only a short conversation remains in the book. I figured it would be a great trivia bit, and who knows, maybe I can revisit that idea in a sequel. The lights went out. A rumble grew louder and louder. He heard frightened screams from other passengers. A knot in the pit of his stomach told him they were about to plummet, then the force of gravity plastered him to the back of his seat. The oxygen masks dropped down from the bulkhead as dim emergency lights came on. With his mask in place, he turned to his right. Kelly had her mask on already and he watched as she helped Joshua. She pulled the white plastic strap, and then held their son’s hand. After nine years of marriage, Sebastian and Kelly could communicate their thoughts with a single look: They didn’t know if they’d make it out of there alive. A flight attendant ran the length of the plane from the back. Even in the dim light, he recognized the fear in her eyes. She made sure everybody was buckled in. She had to shout above the deafening roar. The plane rocked from side to side. A few of the overhead bins opened and luggage pieces bombarded the cabin. He deflected a duffle bag with his forearm. One of the bag’s metal buckles nicked him and blood trickled down from the stinging scratch. The noise increased. A massive tremor shook the plane and Sebastian feared the worst: the fuselage would collapse. The sound of ripping metal filled the cabin, overwhelming any scream. He turned to his wife and saw her moving away. That’s impossible, he thought. A tiny ray of daylight from above illuminated her. He heard a screeching sound as metal wrenched from metal, as the light increased and a section beside the wing broke away from the airliner. With a sense of surreal lingering, an adagio that defied reality, he watched Kelly and Joshua as they were sucked out and away into the emptiness. They hung, suspended, in time, motion and the raw air. His gaze locked on Kelly’s face, her eyes wide with fear. All sound faded away. Through the clear plastic mask, he saw her mouth open. He couldn’t hear her scream, but her voice was crystal clear in his ear. Clouds took their place as the plane raced to earth and left them to follow. Through the gap, air rushed in, creating mayhem and devilry in its onslaught. Luggage, backpacks, shoes, cans, cups, the sick bags, and safety cards from the seat pockets, newspapers and magazines swirled, dipped and dived and danced, like a ticker tape parade, leaving Sebastian gasping from the icy air and smelling the fear all around him. I’m working on serial killer mystery now. I added a fresh twist to it since the killer stages his early victims to look like accidents. I’m hoping to have the second draft ready to send out by the end of the year. Before a writer, I became aware of the notion that I liked entertaining people with stories. Telling high stories to my friends, making awesome excuses that quickly became standard and made the old “dog-ate-my-homework” go into retirement. The idea of actually writing stories took hold in the year before graduation from high school, we’re talking circa 1988, people. However, the idea got stashed in the backseat as I dedicated my time to a profession that would secure me a living. During the 90’s, and with mid-twenties bravado, I figured writing in English should be a piece of cake. Got my first story published in 2007, so yeah, that was easy. During the day, I work running production for an American brand in the garment manufacturing industry. One of the best things of it is that I actually love my job so I don’t mind working overtime when demanded. My writing time is limited to a couple of hours at the end of the afternoon, or nights, and weekends. I know it is not enough since I have to share that time with the promotion of other works, research, etc. But, instead of complaining, I try to get creative with my time allocation in the same vein as my stories. Besides the fact that I write in both English and Spanish, I think probably my weirdest quirk is that I listen to music in the other language. For example, when I’m writing in Spanish, the playlist include The Beatles, Michael Bublé, Aerosmith, Frank Sinatra, Guns & Roses, etc. And I put Spanish singers like Alejandro Sanz, Moises Canelo, Ricardo Arjona, and others, when I write in English. A spy like James Bond, except I’m not from the UK. Then I wanted to become a full-time author, I’m still working on that one, which brings hope. Some people ask me what I want readers to take away from my stories. The answer to that one lies with a previous response in this very interview. I’m a story teller looking to dazzle you, entertain you, and since I can’t be a part of roadshow, I use the written word as my means to reach you. Thanks so much for joining my blog, José. Happy writing!